Well my mom's visit ended today - she's already back home, safe and sound, in Hawaii. I think I'll take a shot at painting again this week. However, I hadn't totally abandoned my efforts while she was here these past three weeks. Here's what I managed to do in-between trips to Victoria, B.C., Crater Lake, OR, Pikes Market, Uwajimaya, Northwest Trek, etc., etc. Primed & initial base coated a box of Victrix French. Helmeted & primed a unit of OG Teutonic Knights & several Battle Honors knights - I used Green Stuff on one to build a flat-topped helm into a Sugar Loaf helm. I plan to paint them using the colorful heraldry from the period, like the ones in the Codex Manesse. Here are OG & 1st Corps Greek Hoplites mounted & separated into two 24-man units. I also hammered & "Dremel'd" brass rods for their spears. I picked the rods up at Fantasy World in Tacoma the other day. Interestingly enough, when I was looking at the rods (which are located to the right of the entrance/exit door) a guy ran out the door with two large boxes of remote-controlled cars under his arms, and without paying for them. The guy was actually caught before he could leave the parking lot. So much for a peaceful hobby. 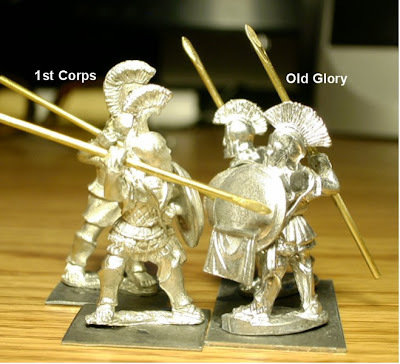 Here's a comparison shot of 1st Corps & OG hoplites. They are a good match in size & style. The most noticeable difference is the 1st Corps helmet crests are a bit thicker than the OG ones; but nothing to distract from the overall look of them together in units. I did replace the 1st Corps shields with Steve Barber models; I traded these with a fellow-TMP member who wanted the larger 1st Corps shields. I've had some good trades on the TMP, by the way. These are OG 12th Century Spearmen from their Mongols in Europe range. Their full-mail armor & kettle hats make them appear to look a bit later in time - I could probably use them in my HYW French army. I've also added brass rod spears to these guys too. They will be in a combined formation with crossbowmen up front - at least before going into close combat. I also fashioned plasticard movement trays, and added magnetic sheets from Joann's. 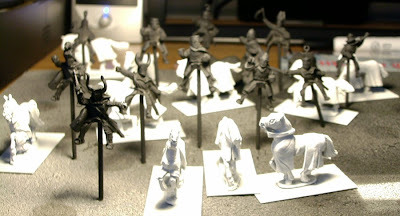 Okay, the next postings should be of painted figures.